POP-UP ART GALLERY – Burien Arts has exhibited art around town in several locations. So far, we have displayed in the lobbies of Burien City Hall and Burien Actors Theatre at the Annex. In 2018, the Pop-up Gallery moved from Burien City Hall to the Burien Community Center. We love to feature established artists and emerging artists alike, including student artists. See details on the Home page and the Gallery page. 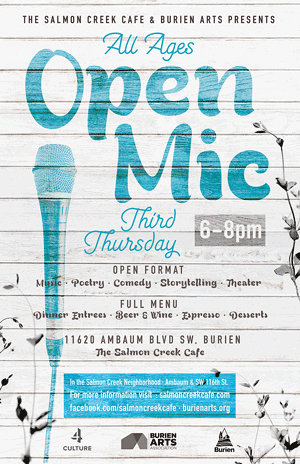 MONTHLY OPEN MIC – Burien Arts sponsors an open mic at the Salmon Creek Cafe every third Thursday from 6:00-8:00 PM. The open mic is for all ages and anything goes–music, poetry, stories, comedy, instrumental music, theater arts. The Cafe is located at 11620 Ambaum Blvd SW, Burien (116th & Ambaum) and serves delicious food and alcoholic and non-alcoholic drinks. See http://www.salmoncreekcafe.com for menu. There is no charge. 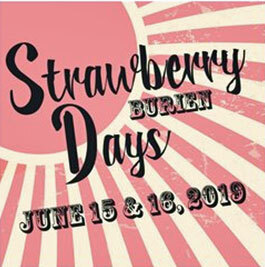 STRAWBERRY DAYS ARTS & CRAFTS SECTION – Starting in in 2019, Burien Arts is going back to the roots of this festival, which we started in 1964 an an arts festival. We are sponsoring an Arts and Crafts section as part of the street fair in Town Square and along 152nd Street. The festival takes place on Father’s Day weekend in June at the Town Square Plaza. You may also pay by credit card in person at the Discover Burien office, 427 SW 152nd St., Burien. You may leave your booth canopy in place for both days. Parking for vendors is provided in the Burien Municipal Parking lot near the Post Office, one block away. Load and unload instructions will be sent later. 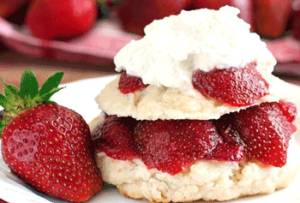 STRAWBERRY DAYS SHORTCAKE BOOTH – Every June in Town Square as part of this annual town festival. The strawberry shortcakes are delicious! Our booth is located in the center of Town Square. Support the arts and buy one or more of our absolutely yummy strawberry shortcakes! This is a major fundraiser for our programs. SHAKESPEARE IN THE PARK – Burien Arts brings two Shakespeare plays to town every summer, usually the last Saturday in July, and first Saturday in August. For 2019, the two productions will be Henry IV, Part 2 on Saturday, August 3, and The Taming of the Shrew on Saturday, August 10. Both plays are by William Shakespeare and will be presented in Lake Burien School Memorial Park. In 2018, the two plays were Henry IV, Part. 1, by William Shakespeare, on July 21 and The Three Musketeers (based on the novel by Alexandre Dumas) on July 28. We are grateful for the support of the City and 4Culture for this program. Burien Arts and Greenstage presented Shakespeare in Dottie Harper Park for the eighth consecutive year in 2016. In 2017, the venue moved to Lake Burien School Memorial Park, 1620 SW 149th Street, Burien. Rest rooms and a playground are available. Bring your folding chair and picnic. Greenstage has been performing Shakespeare in area parks since 1989. Burien Arts participates in the B-Town Beat Art Walk, which runs every first Friday May-October in Burien downtown businesses between 4th and 10th Ave. SW. We have been exhibiting at The Oilerie, 540 SW 152nd Street. ARTS EDUCATION – Burien Arts is committed to arts and education and offers free, hands on, art work shops for students of limited means. 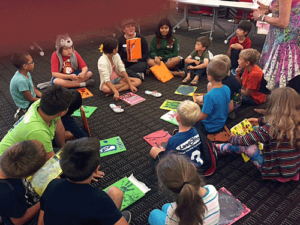 Burien Arts offered these with the King County Burien Library in 2014, 2016, 2017, and 2018. In 2015, we partnered with New Futures to offer these work shops on-site in Woodridge Park. 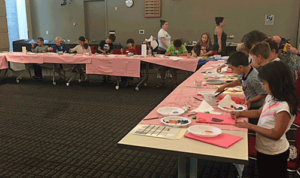 In 2018, free art workshops for students in grades 1-6 took place at the Burien Library, Multi-Purpose Room, on Wednesdays July 11, 18, and 25 from 10:00 AM-2:30 PM and Wednesdays August 8, 15, and 22 from 10:00 AM-2:30 PM. We are busy planning the 2019 program. VISION 20/20 – Each November at the Burien Community Center. This art auction is THE art event of the fall. 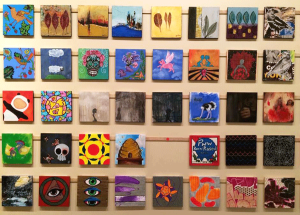 Unique 8″ x 8″ pieces of art are all $40 each, together with a silent auction for larger pieces. Good food, wine, and exuberant company as well as music and prizes complete the evening. This is a critical fundraiser for Burien Arts’ programs. For more information or to exhibit at Vision 20/20, email vision2020.ba@gmail.com. Burien Arts is partnering with the Highline School District and the National PTA Association to bring the PTA Reflections Program to Burien. For 50 years, the National PTA has sponsored an art contest in the Visual Arts, Literature, Music, Photography, Dance Choreography, and Film categories. The 2018-2019 theme is “Heroes Around Me.” Burien Arts is providing art supplies. The opening reception is January 8, 2019, at the Burien Community Center. –Arts-a-Glow Lantern Festival each year. (Sept. 7, 2019) This event takes place each fall in Dottie Harper Park, 421 SW 146th, Burien. 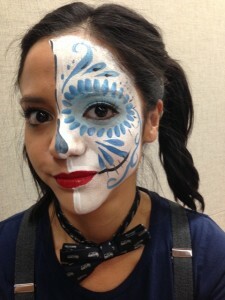 –Dia de los Muertos Celebration Face Painting Booth (Nov. 1, 2019) Burien Arts collaborates with the city to offer free face painting during the Dia de los Muertos celebration. –UFO Festival (sponsored by John White & Shelli Park). This event for UFO enthusiasts takes place in Olde Burien on 152nd, which is closed to traffic for the occasion. Burien Arts has in the past provided face painting. PRESENTATIONS/TALKS/CONCERTS AT BURIEN LOCATIONS – Burien Arts presents interesting speakers in the arts such as poet Shin Yu Pai, who spoke in April 2017 at the Burien Library. Her presentation was on The Painted Word: When Poetry Collides with Art. See details here. We also present concerts, such as the international world flute recording artist Gary Stroutsos, featured on November 30 2017. 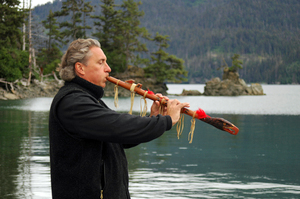 Gary has one-of-a-kind collection of world flute music, featuring traditional love songs from Native American tribes, British traditional music, and introspective Jazz. BURIEN JAZZ WALK (formerly Highline Classic Jazz Festival). Burien Arts presented a jazz musical event 2009-2017. This was a jazz walk 2015-2017. 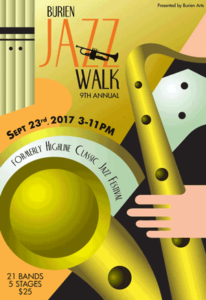 The 2017 Jazz Walk was September 23 from 3:00 -11:00 PM, Olde Burien. On the program were 21 bands & vintage jazz films in 5 venues, all for $25. Venues included St. Elizabeth’s Church, 909/913 Courtyard, Classic Eats, Humble Vine, and Frankie’s B-Town Bistro plus vintage jazz films at The Tin Theater. Musical styles ranged from jazz of the early days of Dixieland to the Swing bands of the 1930’s to the Cool sounds of the 1960’s. Also included were Acoustic Blues, American Roots, and World Jazz. 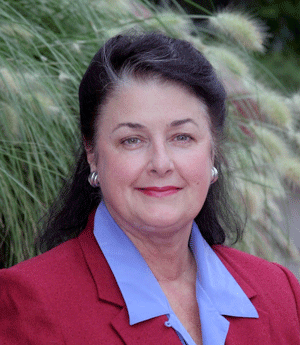 LINDA DOUGHERTY ARTS SCHOLARSHIP – Burien Arts established a scholarship for graduating high school seniors going on to study the arts in honor of our late President Linda Dougherty. The scholarship is offered through the Highline Schools Foundation scholarship program. Awards up to $1000 are available. The scholarship is based on financial need, academic merit, achievement, and the student’s goals. Linda was an active member of Burien Arts since its early days and served many times as president. She was a very visible volunteer at all Burien Arts’ events, especially the strawberry shortcake booth at the Strawberry Days festival each June. In addition, she collected art by local artists and displayed their work in her home. Her administrative savvy was much appreciated; she mentored new board members and shared her executive skills and grant writing expertise. Linda was employed as Director of Road Services for King County government where she was noted for taking leftovers from county events and taking them over to homeless shelters. Linda passed away on July 7, 2015.